Deinonychus was a small, agile carnivorous dinosaur, best known for the sickle-shaped claws on its feet. Deinonychus as well as many other dromaeosaurs is believed to have been feathered (see Feathered dinosaur). However, the only fossils that really support this are from China, and as China is known to have a fake fossil industry, they are most likely fake, as well. Deinonychus was discovered in 1964, and subsequently named in 1969 by the palaeontologist Dr. John H. Ostrom, of Yale University. In 1973 Ostrom compared the skeleton of Deinonychus the skeleton of Archaeopteryx and this led him to suggest that carnivorous dinosaurs could have originated birds. 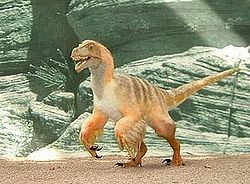 But Deinonychus lived about 30 million years after Archaeopteryx so that might not have been his ancestor. Several Deinonychus skeletons have been discovered alongside the skeleton of a Tenontosaurus. Several scientists have interpreted this as evidence that Deinonychus was a pack hunter, just like modern-day wolves. ↑ Shipman, Pat (1998). Taking Wing:Archaeopteryx and the Evolution of Bird Flight. New York: A Touchstone Book/Simon & Schuster. p. 114. ISBN 0-684-84965-8. ↑ Sloan, Christopher (2000). Feathered Dinosaurs. Washington, D.C.: National Geographic Society. p. 12. ISBN 0-7922-7219-6. ↑ Werner, Carl (2007). Evolution: The Grand Experiment. Green Forest, AR: New Leaf Publishing Group. p. 160-161. ISBN 978-089221681-9. This page was last modified on 7 April 2013, at 10:01.